Trump previously said he, not his lawyers, write the answers. "The President today answered written questions submitted by The Special Counsel's Office. The questions presented dealt with issues regarding the Russia-related topics of the inquiry. The President responded in writing,” Jay Sekulow, Counsel to the President told ABC News in a statement on Tuesday. The special counsel's office did not comment. "I write the answers. My lawyers don't write answers," Trump said last week when asked by reporters about the special counsel’s questions. "I was asked a series of questions, I answered them very easily." The questions submitted to Mueller were broken up into five parts and focused on potential Russian collusion during the 2016 elections, sources close to the president told ABC News. A few of the questions focused on Trump's longtime political ally, Roger Stone, though those questions did not dominate. Trump's personal attorney Rudy Giuliani, told Axios that he and fellow team lawyers Jay Sekulow and Jane Raskin took handwritten notes before the material was typed up and were with the president in the Oval Office and the private dining room adjoining the Oval during the sessions. Giuliani said Mueller asked whether Trump knew at the time about his son, Don Trump Jr., meeting with Russians during a June 2016 Trump Tower meeting. The special counsel also reportedly asked about Russian hacks that occured after Trump's July 27, 2016, press conference in Florida, when the then-candidate said: "Russia, if you're listening, I hope you're able to find the 30,000 [Hillary Clinton] emails that are missing," according to Axios. In returning his written answers to Mueller, the president capped a months-long negotiation with the special counsel over the subject and quantity of questions relevant to the Mueller’s mandated investigation of Russian meddling during the 2016 campaign. "It has been our position from the outset that much of what has been asked raised serious constitutional issues and was beyond the scope of a legitimate inquiry. This remains our position today. The President has nonetheless provided unprecedented cooperation. The Special Counsel has been provided with more than 30 witnesses, 1.4 million pages of material, and now the President's written responses to questions. It is time to bring this inquiry to a conclusion,” Rudy Giuliani, the president’s attorney told ABC News in a statement. ABC News previously reported that the president spent several days last week huddling with his legal team to prepare his answers, which focus largely on alleged Russian meddling in the 2016 election. Trump told reporters last week that he was concerned investigators might be using the questions to try to catch him perjuring himself. 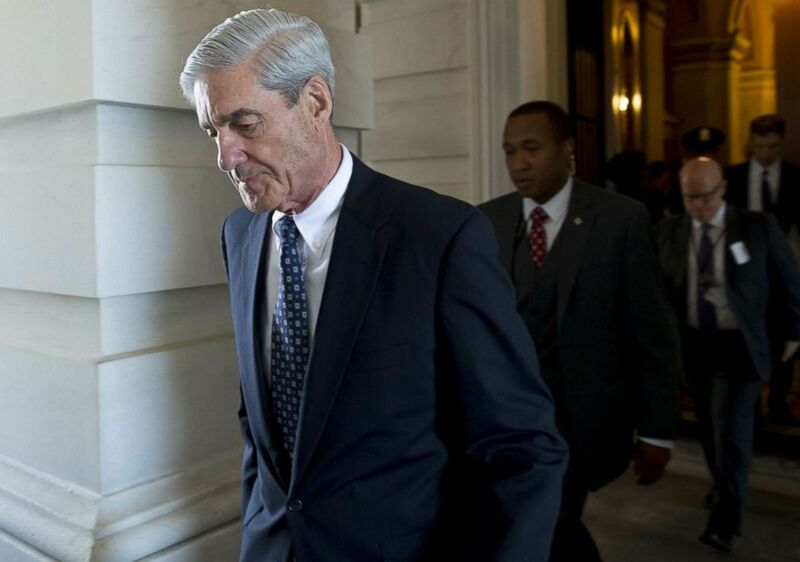 (Saul Loeb/AFP/Getty Images, FILE) Robert Mueller, special counsel on the Russian investigation, leaves the U.S. Capitol in Washington, D.C., June 21, 2017. Despite repeatedly expressing a willingness to sit down for an in-person interview with special counsel prosecutors, Trump told “Fox News Sunday” over the weekend that he has “probably” ruled it out, though he reserved the right to change his mind. Over the course of his 18-month long probe, Mueller and his team of prosecutors have secured indictments against 32 individuals and three Russian businesses on charges ranging from computer hacking to financial crimes. Those indictments have led to six guilty pleas and three people sentenced to prison. A former campaign aide and three former Trump campaign officials – including his onetime national security adviser Michael Flynn and campaign chairman Paul Manafort – are among those who have pleaded guilty.